I liked this play a lot. It wasn’t necessarily life-changing, and I wouldn’t necessarily insist that you need to pay full price for a ticket, but I would say that if you have the opportunity to go, take advantage of it for a unique theatrical experience. 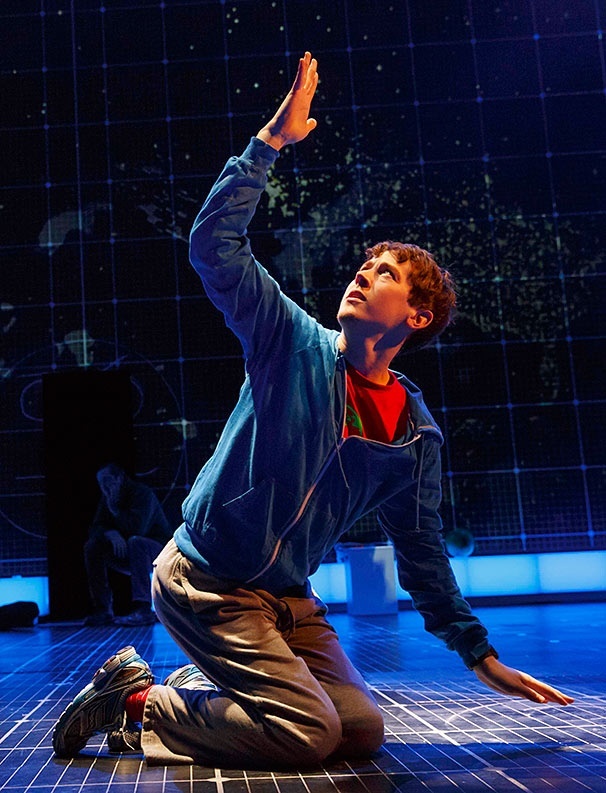 For the people out there who have not read the book (or the people who have and simply forgot everything about it like me), The Curious Incident of the Dog in the Night-Time came out in 2003, written by British novelist Mark Haddon. It’s about a 15-year-old boy named Christopher Boone. Christopher is extremely gifted in math, logic, and all things science, but he struggles socially. He doesn’t like when people touch him. He is easily overstimulated and screams until he is able to calm down. He has a complicated relationship with his dad and maybe an even more difficult relationship with his mother before she passed away two years earlier. The story begins with a neighbor’s dog being murdered. And à la John Coffey in The Green Mile, Christopher is found cradling the dead dog and is immediately accused. He makes it his mission to find out who did it and starts detective work even though he doesn’t like talking to strangers. But as he starts to dig, other mysteries begin to unravel as well, forever changing his life as he knows it. The production (a transfer from the National Theatre in London) is very innovative and smart. It’s well-directed, and the design is arguably the best part. The creative team has done an excellent job of making the audience feel – or at the very least, understand – how Christopher feels day-to-day. In one scene, he explains that he “sees everything.” You know how Raymond counts the toothpicks in a split second? Like that, Christopher registers every single thing around him. Therefore, if he’s in a crowded place like a train station, it’s an unreal amount of stimulation that overwhelms and cripples him until he is able to find a rhythm to the madness. This then guides him back to his own personal equilibrium. So, through a slick scenic design, charged music, flashing lights, and incredibly well-used projections, the stage transforms into what’s going on in his brain during these moments. It can be very unnerving at times (in the best way possible). With such an effective design and moving choreography, the creators have set up a great storytelling convention for us to go directly into this kid’s mind. Now that I think about it, even in the calmer sections, the design is still how Christopher sees the world – like a grid, finding whatever sense he can in his surroundings. For example, he builds a train set throughout Act 1, literally taking the different pieces out of the walls around him. Everything is compartmentalized, organized, and clean…until it’s not, and he panics. Christopher is wonderfully played by Alex Sharp, a 25-year-old recent graduate of Juilliard (and by recent, I mean this past May). You’re looking at a future Tony nominee, folks. Now this isn’t exactly a heads-up per se, but I feel like I should note again that this production came over from the West End, and you can definitely tell. This is British theatre at its core. It’s hard to explain what I mean by that. Basically, the style is different – the way of storytelling, the pacing, etc. Quite often, it can be tricky for plays to make the jump across the pond for these very reasons. Sometimes, American audiences have a difficult time adjusting to the style shift. I’m very curious to see what the critics will think. I personally like that it’s structurally different and that the storytelling makes you work, although the pacing was often a problem. I was bored at times, and it’s a little long. Granted, I saw it in the middle of previews, so this may change (they even had to hold for a few minutes during Act 2 due to technical difficulties. Ohhh previews.). So my bottom line? It’s a striking design and a very, very technical show, but what’s lovely – and crucial – is that amidst all the flash and spectacle, Curious doesn’t lose its heart.